Ch. Kilrak Sandie Beaches - "Beaches"
As with all breeds of any antiquity, the origin of the Scottish Terrier is unknown. All that is known is that in the Western Highlands of Scotland and the Islands of the Hebrides there existed a terrier on short legs with a rough coat. 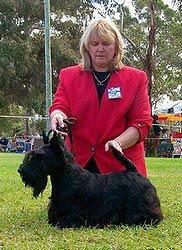 It was not until 1879 that the breed was officially recognised as the Scottish Terrier. They are closely related to the Skye Terrier, the Dandie Dinmont, the Cairn Terrier and the West Highland White. Scotties are thick set with short legs. Head is distinctive and gives the impression of being long for size of dog. Very agile and active in spite of their short legs. Loyal and faithful, dignified, independent and reserved, but courageous and highly intelligent. Known for the reserved nature of a true Scotsman. Alert and active. Bold, but should never be aggressive. A big dog in a compact body. Grooming is best done once a week, brushing energetically with a hard bristle brush. Normally, the dog&Mac226;s coat should be brushed against the growth and then be brushed thoroughly back with the growth to remove burrs and dead hair. Pets need to be trimmed using clippers and scissors about 4 times a year to keep the "Scottie" look. If left untrimmed their hair will grow and the dogs will lose their distinctive body shape. Show dogs coats are hand stripped to maintain the harsh dense coat. The coat is a double one. The outer coat is harsh, dense and wiry, the undercoat short, dense and soft. These coats make a weather-resistant covering for the dogs and provide warmth and resistance to wet. Another reason for such a thick coat is protection for the dog in his original work, hunting. A mouth full of hair was often the only protection provided for the skin when attacked. Scotties are fortunate to have few serious genetic problems compared to other pure bred dogs. Responsible breeders work to eliminate these problems from the gene pool. Although rarely seen, the most common genetic problems we see in Scotties. Von Willebrand's Disease. An inherited bleeding disorder of man and dogs. In fact, it is the most common bleeding disorder, and has been detected in over 54 breeds. The disease reduces the ability for the blood clot or coagulate. Ch. Greatscott Silver Sand - "Oscar"
Cushing's Disease. There are two main causes, a tumour on the pituitary or adrenal gland or over prescribed corticosteroids to treat skin problems. Symptoms include drinking large amounts of water and urinating frequently, losing coat, loss of muscle tone and developing a pot belly. Epilepsy can be caused by low blood sugar, heat stroke, poison (as in the dog eating poisonous plants), brain tumour or nutritional deficiency. Height: 25.4-28 cms (10-11 ins) high at the neck. Weight: 8.6-10.4 kg (19-23 lbs).